Continuing the celebration of my 2nd banjoversary, I'm taking a look back at the past year in banjo. I'll do this in two parts, so here's a look at mid-June through mid-December 2008. I'll hit the remaining six months in my next post. So enjoy — if this is your kind of thing — a story of banjos, guitars, jug bands, Earl Scruggs (or not), penguins and one even shorter banjo. We begin where last year's banjoversary summaries (parts one and two) left off. The Banjo versus TV project was going strong, with the banjo ahead 188 hours to 146 hours after 24 weeks. I'd just gone to Midwest Banjo Camp 2008 and was ready to try some of the things I'd learned there. I started off the year by doing something big: I switched banjo teachers from Mike, who I love, to Dave, who I also love but who is more experienced in the bluegrass style that I was pursuing (and still am). Dave and I talked high-level goals. My answer to "Where do you want to be a year from now?" was "Participate well in jams. Play comfortably solo." I came up with six songs that I'd like to learn to play well at jams. Saw some great zydeco from New Orleans: Chubby Carrier and The Bayou Swamp Band. I learned a thing or two about flying with my banjo. Earlier in the summer I'd heard James McKinney (at Midwest Banjo Camp) strongly recommending that we Scruggs-style players should bend our index- and middle-finger picks so they're snug against our fingers. The idea is that the brain will better respond to signals that go through the bone; an idea that McKinney says is supported by recent research in sports medicine. Besides, Earl bends his picks like that. So I decided to bend my picks up and get used to it that way. It took a couple of weeks, but I adjusted to the new pick style and I like the feeling. I had my first lesson with Dave, who was happy (encouraging, even) to let me record lessons and review them on my blog. I began work on a solo for one of my six chosen songs: Good Old Mountain Dew. I found some terrific swabs for banjo cleaning. I completed that solo for Good Old Mountain Dew. The solo sounds much better when I'm warmed up. Although I didn't know the fancy name of it at the time, I got into Mixolydian mode by playing along with a Sam Bush recording of Ol' Joe Clark. I played my banjo for the neighbors who live across the street from the home I grew up in. They said my father would be proud, which is just about the best thing that anyone could say to me. Some other topics from my banjo lessons: playing and singing at the same time, playing along with and learning from recordings, warming up before a lesson, recovering from wrong notes, left-hand positioning and muting. I'm really starting to like Dave's play-along-with-recordings approach. I made a pilgrimage to the Four Corners Folk Festival in Pagosa Springs, CO so I could see Earl in person. But it turned out to be one of the very rare occasions where Earl cancels at the last minute. 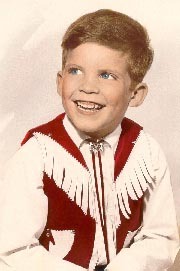 On the up side, I got to know Warren Kennison, Jr., the guy who filled in for Earl at the festival. Warren's a great guy who would later invite me to go with him to the July 2009 RockyGrass festival. At 4CFF I met the members of Crooked Still and really got to like their "new time old time" style of music. Their banjo player, Greg Liszt, plays with four picks! I brought together two things I'd been working by incorporating that Bill Knopf lick #1 into my solo of Good Old Mountain Dew. Everyone (Mike, Dave, Pete Wernick) tells me that I should learn how to recognize a few simple guitar chords so I can follow the guitar at a jam. I figured that the best way to learn those chords is to take a few guitar lessons. So I started guitar lessons, which cut into my banjo time a bit. I had a wow-I-can-really-do-this moment when I decide to try out my playing-along-with-the-recording skills on some random bluegrass tracks over lunch. Yay me! Some other topics from my banjo lessons: a balanced practicce routine, using a metronome and stronger pull-offs. There was this idea I'd been kicking around for a while: shortening the neck of a banjo by 12 frets. I call it my sawed-off banjo. I started work on it by drawing out plans for and creating balsa and styrofoam models of its sawed-off little neck. My plan to do regular practice of right and left hand exercises is short-lived, fizzling out quickly. Dave suggested that, despite the long-term goal to play without looking at my hands, I should really be watching my left hand as I play so I can work out some of its bad habits. The sawed-off banjo project moved from plans and models to actual construction! My business partner, Don, and I started work on the sawed-off banjo in his well-equipped wood shop. Some other topics from my banjo lessons: rewriting material, mixolydian mode, open C tuning, vamping and changing the sound of the banjo. We completed the sawed-off banjo, which looks funky and sounds really nice. You can see all of the details of its construction here. I completed my short set of guitar lessons. The plan was that I'd learn enough to be able to recognize certain chords when the guitar played them at a jam. (G, C and D, mostly.) The lessons probably took me 75% of the way there. I attended Chicago's First Annual Battle of the Jug Bands, which put me on a jug band journey that I kinda didn't expect to take, but which turned out to be a lot of fun. 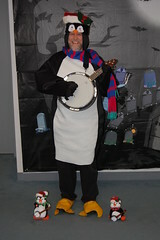 I was a banjo-playing penguin for Halloween; a costume that nicely incorporated the sawed-off banjo. I won first prize in the costume contest at a Bluegrass Legends Concert in Evanston, Illinois. I purchased a jug. It's not played by blowing across it as I thought it was; it's played more like a bugle. Embouchure is very important. Jim Craig (of Hogeye Music) demonstrates.
. The jam is hosted at a sandwich shop, so every time I go there I buy a sandwich and get my frequent customer card stamped. Eight more stamps until my free sandwich! My jug band obsession continued with a grand plan to put together a family jug band at my our semi-annual, post-Christmas, family vacation. I asked everyone what jug band instruments they'd like and started shopping. Incidentally, I had this idea before I even saw Emmet Otter's Jug Band Christmas. My jug band research led inevitably into a comparison of the two Muppet jug bands: Lubbock Lou & His Jughuggers and The Gogolala Jubilee Jug Band. 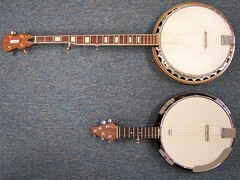 Some other topics from my banjo lessons: my next banjo and bridge height. Arlo Leach, who hosted Chicago's First Annual Battle of the Jug Bands, taught the Wednesday night jug band class at the Old Town School of Folk Music. 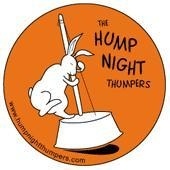 The class calls itself the Hump Night Thumpers. Arlo invited me to come to a class, so I did. What a lot of fun! Taking those few guitar lessons took me maybe 75% of the way toward my goal of recognizing guitar chords by watching the guitarist's left hand. To help me get to 100% I began playing along with Pete Wernick's jam DVD, which feature a zoom-in on the guitarist's left hand. Speaking of family, a few hours before arriving from Texas to celebrate her birthday Denise (age 7) decided that it'd be nice if Unca J.R. would play Happy Birthday for her on his banjo. So I learned it. I performed in Flatts & Sharpe's annual recital, doing a medley of my two best songs: I'll Fly Away and This Land Is Your Land. Some other topics from my banjo lessons: books at jams, watching the guitar player for chord prompts and key changes. Coming up next: A look at the second half of the year. 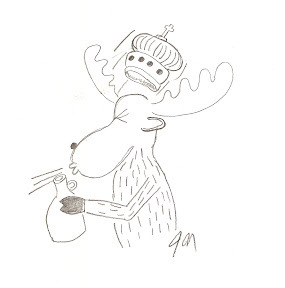 The Royal Moose Jug Band performs! The Banjo versus TV project concludes — or does it? I join another jug band! And so much more! But I still don't get to see Earl.